This is the end. The conclusion of Gail Simone's huge crossover event, 'Swords of Sorrow,' with the giant battle taking place in the main series. 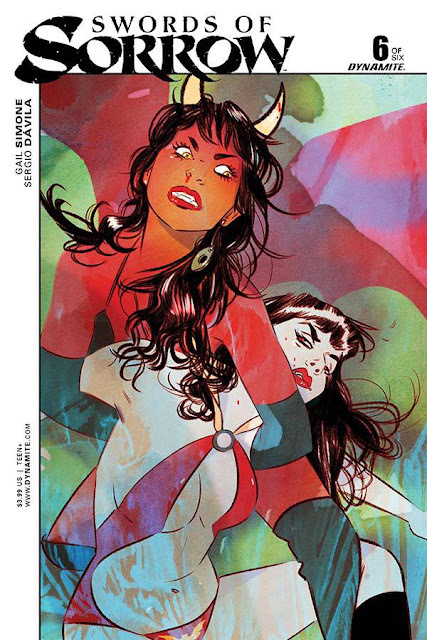 It's not perfect (no event this size ever is) but issue six elegantly displays the heart, grit and sheer determination of Dynamite's great catalog of strong heroines fighting to the end. As a comic book event, 'Swords of Sorrow' was a mixed bag. Simone's series was great, but that was expected. The one-shots and minis didn't always resonate or add value to the overarching plot but if nothing else they exposed readers to heroes they may have overlooked. The same goes for the talented creative teams that all featured female writers. The best stories apart from Simone came from Erica Schultz, Leah Moore, Nancy A. Collins, and Emma Beeby. 'Swords of Sorrow' gave these characters and writers the attention they deserved. The story of Prince Charming assembling an army of villains to bring about the apocalypse and recapture his lost love, Snow White, forced the Traveller to assemble her own warriors. Crossing dimensions, planets and time periods, the Traveller sent the Courier to convince women like Kato, Masquerade, Black Sparrow, Lady Zorro, and others to join the fight against the ultimate evil. It would take her hand-picked generals, Dejah Thoris, Red Sonja and Vampirella to lead this battle wielding the power of their swords to ultimately defeat the Prince. It's a wonderful premise that could have been told better with half the characters and in a single limited series. Nonetheless, this ambitious venture highlighted under appreciated characters like Black Sparrow, Lady Zorro, Jennifer Blood and others using the incredible artistry of illustrators like Sergio Davila, Dave Acosta, and Mirka Andolfo. Davila especially does an amazing job juggling the number of characters on every panel in this last issue. The layouts are clean and uncluttered which is a miracle considering how many bodies, weapons, and blood there is as the fight covers virtually every page. I have no doubt Davila can do anything, but his fantasy designs from Purgatori to the Shard Men are dynamic and visceral. Having to differentiate each character from their respective worlds and integrate them on one battlefield is an achievement unto itself. Davila handles the chaos with the precision of a surgeon creating a fierce landscape of frenzied combatants. Jorge Sutil's colors flesh everything out giving each panel the depth and nuance it needs to distinguish the fighters while keeping what makes each of them unique. 'Swords of Sorrow' may be over, but it was an event that needed to happen. These great characters earned their place among any at the Big Two and some predate even those. Does the event always succeed? No, but there's more goodness to derive from it than not. Simone's great ambitions pay off by bringing together so many talented women and creating a platform for overlooked characters that prove themselves to be as compelling as any in comics. As for issue six, Simone smoothly ramps up the tension and action to conclude the epic battle between good and evil that satisfies while defining what it means to be a female warrior.